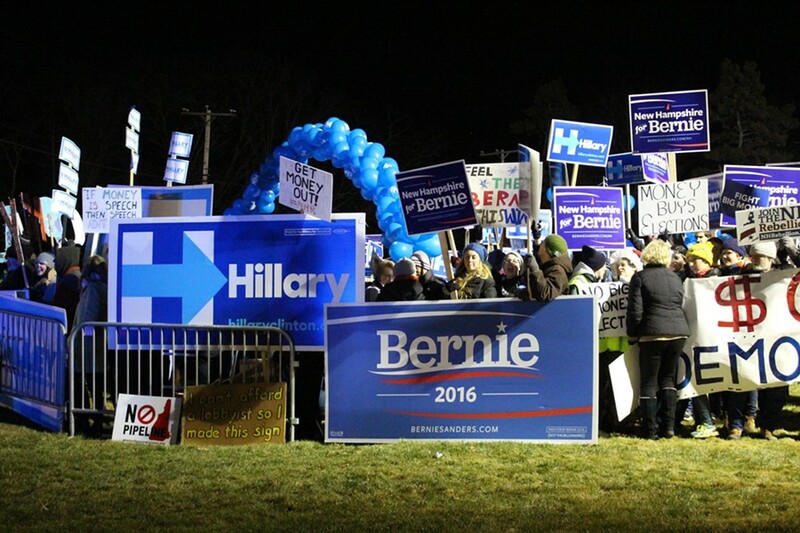 Bernie Sanders and Hillary Clinton debate in Goffstown, N.H. Updated December 20, 2015, at 11:49 a.m.
Sen. Bernie Sanders (I-Vt.) apologized Saturday night for the behavior of campaign staffers who accessed voter data belonging to rival Hillary Clinton — but his apology took a little prodding. 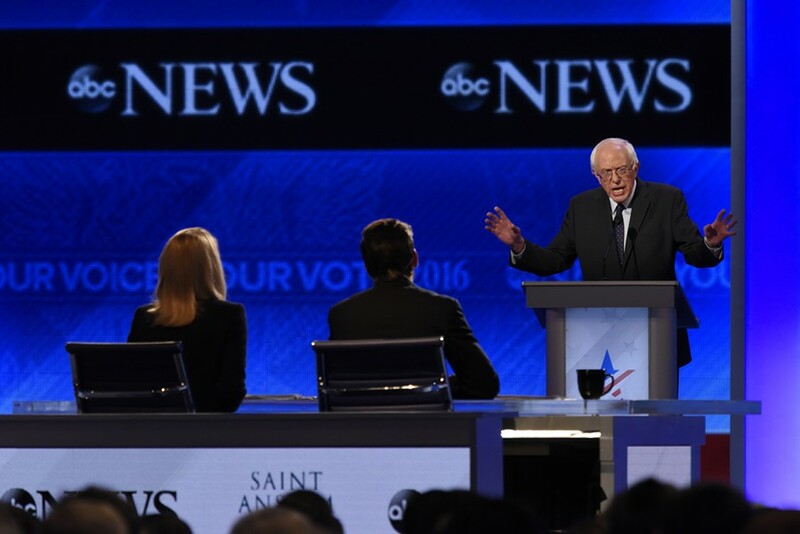 Asked about the controversy at the third Democratic presidential debate, in Goffstown, N.H., Sanders at first delivered an extended explanation of the drama that had subsumed his campaign in recent days. He criticized the Democratic National Committee, its data vendor and even the Clinton campaign, which he suggested may have accessed his own proprietary information. Only after moderator David Muir of ABC News asked whether Clinton deserved an apology did Sanders actually express remorse. "Yes, I apologize," the senator said, not looking happy about it. 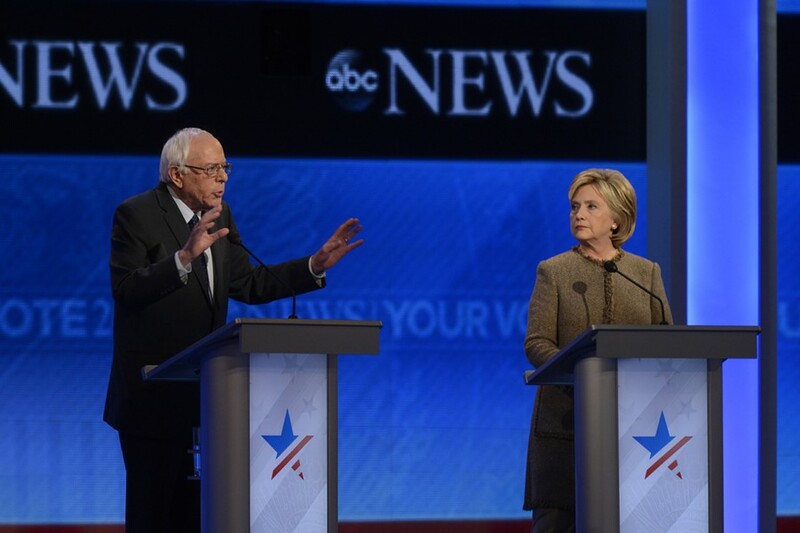 As Muir turned to Clinton for a response, Sanders jumped back in to offer a fuller mea culpa. "Not only do I apologize to Secretary Clinton — and I hope we can work together on an independent investigation, from day one — I want to apologize to my supporters," he said. "This is not the type of campaign that we run. And if I find anybody else involved in this, they will also be fired." The mixed response — animosity paired with contrition — was not unique to Sanders. Before Clinton took the stage at Saint Anselm College, her top advisers appeared eager to fan the flames. In a statement posted to the campaign's website earlier in the day, communications director Jennifer Palmieri posed "four questions Bernie Sanders needs to answer" about the data saga and again accused the Vermonter's campaign of "theft." After the debate concluded, campaign manager Robby Mook told Seven Days his team would “suspend judgment” until the release of an independent audit — but he didn't sound ready to drop the subject. “I can’t say whether new developments are going to come out or what’s going to happen,” Mook said. Onstage, his boss responded much more magnanimously. "I very much appreciate that comment, Bernie," Clinton said after Sanders apologized. "It really is important that we go forward on this." Around Saint Anselm’s compact campus in the suburbs of Manchester, much of the conversation — between supporters, aides and reporters — focused on the negative turn the Democratic campaign had taken in recent days. But inside the debate hall, each of the candidates tried to make clear they’d prefer to talk about more substantive issues. Even former Maryland governor Martin O’Malley, who has struggled to compete with Clinton and Sanders, appeared eager to talk about how they shouldn’t be talking about the matter. 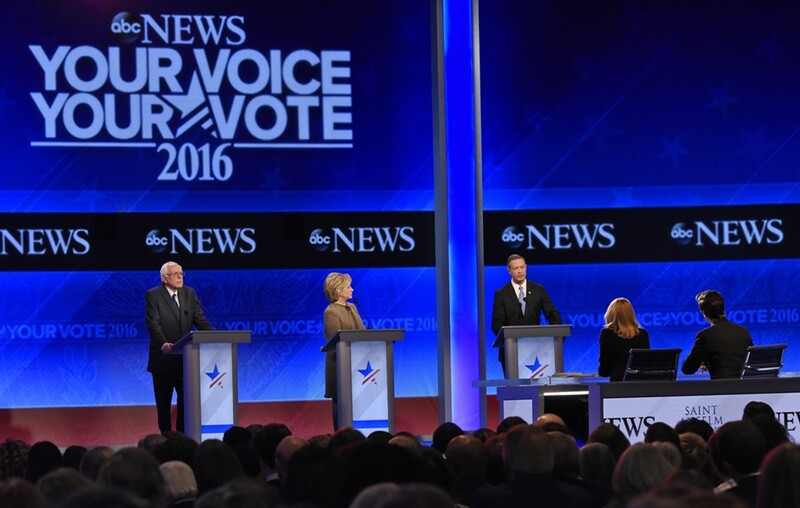 For the rest of the debate, the candidates bickered instead about foreign policy, taxes, guns and who disagreed the most with Republican candidate Donald Trump. 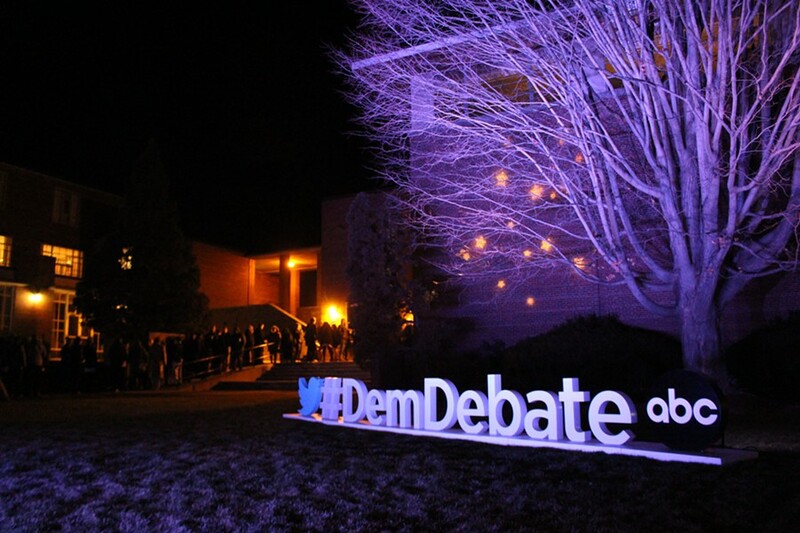 The Democratic presidential candidates debate in Goffstown, N.H. In the weeks since terrorists struck targets in Paris and California, Sanders has appeared reluctant to allow national security to displace economic policy as the focus of the race. But the candidate seemed more willing Saturday night to articulate his worldview — and to contrast it with Clinton’s. Clinton was prepared to pounce. But Sanders, inexplicably, did not defend his record. Even after Clinton raised the resolution a second time, he failed to correct her. To Clinton, it was not an “either/or” proposition. Prompted by moderator Martha Raddatz, Clinton tied global terrorism to domestic gun control, arguing that reducing violence required fewer firearms and a greater emphasis on addressing extremism. Asked if he would “discourage people from buying a gun,” Sanders said, “It’s a free country in which people choose to buy guns … That’s the right of the people.” But he characterized himself as the candidate best equipped to find consensus on what he called “sensible gun-safety regulations,” such as universal background checks and bans on military-style weapons. O’Malley, who has made gun control a centerpiece of his campaign, opted to attack both Clinton and Sanders on the issue. 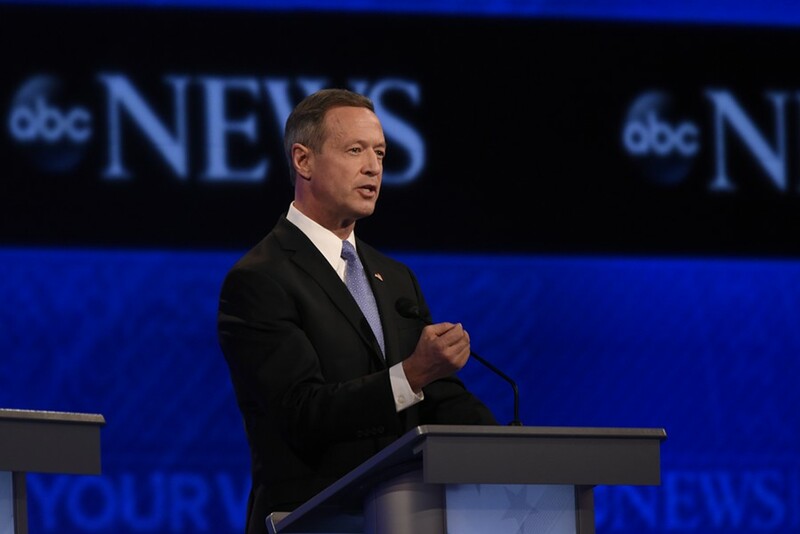 O’Malley topped off his attack by alleging that his opponents’ “flip-flopping, political approach” had made it easier for ISIS-inspired “lone wolves” to buy assault weapons at gun shows. “Yes, let’s tell the truth, Martin,” Clinton agreed. All three candidates competed to stand up the tallest to Trump, whose call for a ban on Muslim immigration has ignited the Democratic base. For his part, Sanders framed his criticism of Trump in economic terms. Rather than address inequality, Sanders said, the Republican was employing racist language to distract low-income Americans from what ails them. “So what I say to those people who go to Donald Trump's rallies, understand: He thinks a low minimum wage in America is a good idea. He thinks low wages are a good idea,” Sanders said. The Vermont senator was clearly quite pleased when debate moderators finally turned to tax policy, roughly an hour and a half into the debate. “Now, this is getting to be fun,” Sanders said. Sanders, who has proposed many such programs, and O’Malley both said they would make no such promises. As she has for months, Clinton criticized the cost of Sanders’ education and health care plans. To that, Sanders said, “Secretary Clinton is wrong.” Replacing premiums and deductibles with a single-payer system, he said, would save Americans money — even though they would face higher taxes. How much higher those taxes would be remains unclear. Sanders wouldn’t say at a debate last month in Iowa — and he wouldn’t say Saturday night in New Hampshire. Asked three times by Raddatz, Sanders continued to dodge and weave. “I’m curious: Eight years later, should corporate America love Hillary Clinton?” he asked. Asked if “corporate America [would] love a President Sanders,” the senator took a different tack.